This mixtape was curated by the twin sister duo, and features tracks and anthems that inspire acceptance, freedom, self expression and love. 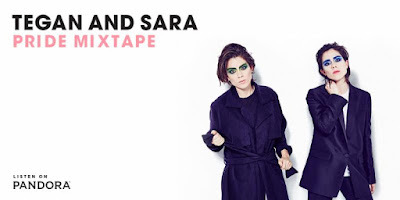 Tegan and Sara's latest album "Love You To Death" was released on June 3. "We get asked a lot what kind of advice we would offer to young people who are coming out, or just to anyone about self-love, and the truth is that the best advice I was ever given about pride and self-love was from my mom when I was very young which was just to be cool. Be you. I think that Sara and I have really just done that. So I offer that advice to all of you. Just be yourself. You're cool."